﻿ South Jersey Home Remodeling Contractors - Daniel Gregory, Inc.
Daniel Gregory, Inc. is a Home Remodeling Contractor serving South Jersey. We work in Gloucester County NJ and surrounding areas. With over 50 years of experience, we will provide you with the highest level of service in the industry. 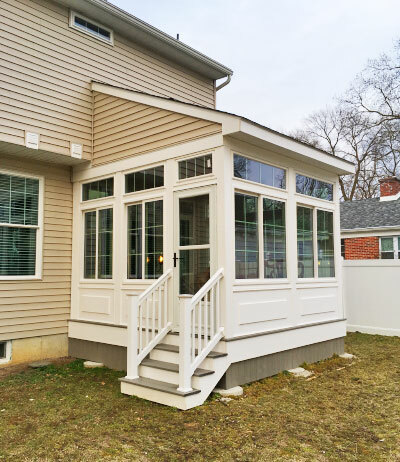 Our South Jersey Home Remodeling services include general remodeling and restoration, home additions, basement remodeling, garages, decks, sunrooms and patios, porches, kitchen and bathroom remodeling, custom cabinets, and more. We use only the highest quality materials, we pay attention to the details, and we don't cut corners. Daniel Gregory, Inc. is fully insured, and a licensed home builder and home improvement contractor in New Jersey. We are also an EPA Certified Lead Renovator (#NAT-88876-2), which means that we are trained by the EPA and follow lead-safe work practices. And for your peace of mind, the company owner, Winfield E, Ziegenfuss, Jr., is present on all jobs. We have received numerous MAME awards from the Builders League of South Jersey (BLSJ) for our remodeling projects. Call Daniel Gregory, Inc. at 856-371-1862 for all your South Jersey (Gloucester, Salem, Camden and Burlington County NJ areas) Home Remodeling needs. © Copyright Daniel Gregory, Inc.
219 Commissioners Road, Mullica Hill, NJ 08062.